Carolina Farm Credit employees take time to clean the stretch of road in front of their Statesville Administrative Office. Carolina Farm Credit employees recently took the time to clean the length of road in front of the Statesville Administrative Office. 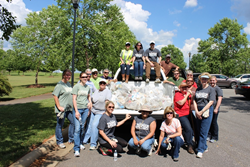 20 employees worked one afternoon to pick up litter on the side of Victory Lane in Statesville. “Carolina Farm Credit and its employees remain committed to serving the local communities in which we work and live. By taking pride in our communities we can help to enhance the way of life in rural America.” said Vance C. Dalton, Jr., CEO of Carolina Farm Credit. Nearly a truckload of garbage was picked up on the 1 mile stretch from Old Mocksville Road to the office on Victory Lane.